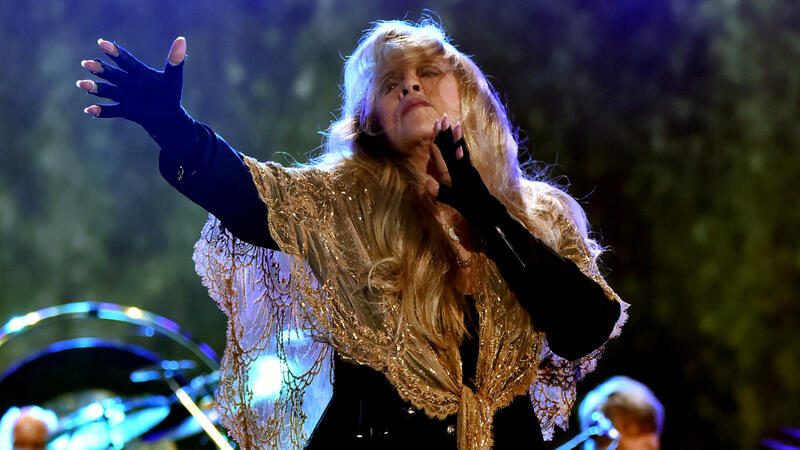 Stevie Nicks of Fleetwood Mac performs onstage during the 2018 iHeartRadio Music Festival. To be nominated, groups or artists must have released their first commercial recording 25 years or more prior. Each year's inductees are decided by "more than 1,000 [previous] inductees, historians and members of the music industry, as well as the aggregate results of the Rock Hall's online fan vote," the Rock Hall explains on its website. This year's list includes just three women, one of whom, Stevie Nicks, was already inducted as a part of Fleetwood Mac. Three notable premier nominations are Roxy Music, Def Leppard and John Prine — the latter of whom could be considered a shoo-in, given his advancing age, prolific output and the high esteem in which he is held by many of his peers. The Hall's nominations-first, inductees-second announcement strategy is of course a purposeful one, for at least two reasons. It generates a lot of publicity (for example, the piece you're reading right now) and it allows its voting members to take the public's temperature on its possible inductees before casting their deciding ballots, giving it a measure of control over its public reputation. It's a win-win, with no "real" losers. Except, that is, for those who put little stock in the whole shebang — even they are nominees, as Def Leppard became today. Speaking to the Huffington Post in 2015, singer Joe Elliot said that his band would decline induction if it ever came to it and that the recognition of a platinum record is far more meaningful to him, "because it's a representation of one million people who've bought your album, and those million mean a lot more to me than some people that decide whether you fit for the Hall of Fame." Speaking to Billboard Tuesday after the Hall's announcement, though, Elliot pivoted a bit, telling the trade publication that he is "definitely not Groucho Marx, 'Any club that would have me as a member I don't want to join.' When you think that every band that means anything in the world, starting from the Beatles and the Stones and any artist that influenced them — your Chuck Berrys, your Little Richards, etc. etc. — then of course you want to be in. Why wouldn't you?" In considering the Rock & Roll Hall of Fame, its nominees and the wider importance of both, it might be useful to look at its roots. The music industry's history is, in no small part, one of backroom exploitation, and the Hall is no exception. It's a classically duplicitous story. In Sticky Fingers, the biography of Rolling Stone founder Jann Wenner, Joe Hagan writes of the Hall's conception by Bruce Brandwen, who first envisioned it as a pay-per-view television event. Brandwen and his lawyer approached Ahmet Ertegun, founder of Atlantic Records and to many the totemic record executive of the 20th century, to run the operation, which then signed a five-year contract with Brandwen's television production company, the Black Tie Network. Hagan outlines how the record industry moguls that Ertegun recruited to run the fledgling operation saw a greater potential for the Hall after the city of Cleveland, where the Hall is now based, pitched them on the funding and groundbreaking of a museum. Fast-forward a few years, and Brandwen had sued the Hall for breach of contract after stalling on the induction ceremony's broadcast, eventually settling out of court and severing any ties he and his company had in it. "Removing the Black Tie Network did what the record men intended: It gave the nonprofit institution the fig leaf it needed to shield against the moneygrubbing reputation of the music business itself," Hagan wrote. It was a "beautifully crafted stall," Brandwen told Hagan. But the dark side is never the only side — and the Hall isn't defined by its origin story, tied as it is to a largely white and male circle of power brokers. The process of nominating and inducting artists into the Hall may be infamously opaque, but it's not evil, either. "Although I was only 43, I always considered the launch of the Rock & Roll Hall of Fame as a rite of passage," writes another legendary record man, Seymour Stein, in his memoir, Siren Song. "We all had to do our own private research, prepare notes, debate inductees, and basically map out the story of popular music, both behind the scenes as well as musically." So in December, when the Hall again grabs headlines for announcing who of this year's 15 nominees will be invited to its ceremony in Brooklyn and broadcast on HBO next spring, perhaps it is worth treating those announcements with the same duality that lies at the center of the institution itself.